Hello – I saw that you used a large horizontal delta loop in this listening session. I was wondering if you could provide some more information on it (height above ground, how many feet of wire, etc) and the question that I am most interested in getting an answer to – do you use an antenna tuner with it for your listening sessions? or does the feedline from the antenna go straight into your receiver? A lot of what I see on the internet are antennas for transmitting that make use of an antenna tuner to give a single antenna multiband capability and I am not sure if that is important in receive antennas as well. Thanks for your time. I was on 31M this morning too Thomas. I was making a calibration graph for a coil I had just wound for the Sproutie specifically for the 31M band. I get coverage from 9280 to 10050, which is perfect. I must have heard most of the stations you heard, as I counted 49 calibration points. I wasn’t identifying them though, as I was simply using them as markers for calibration purposes. In some of the lower and middle parts of the band, there were stations every 5KHz! 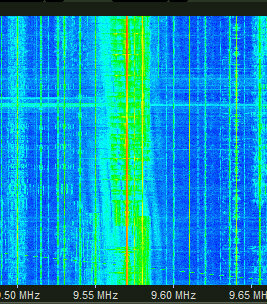 I also heard a very weak carrier at 9930KHz, though I’m not sure what it was. It is amazing when a band really comes to life like 31M did this morning. The irony is, I could see that propagation was good via my SDR’s waterfall display. With with your home brew Sproutie regen receiver, it was pure discovery!